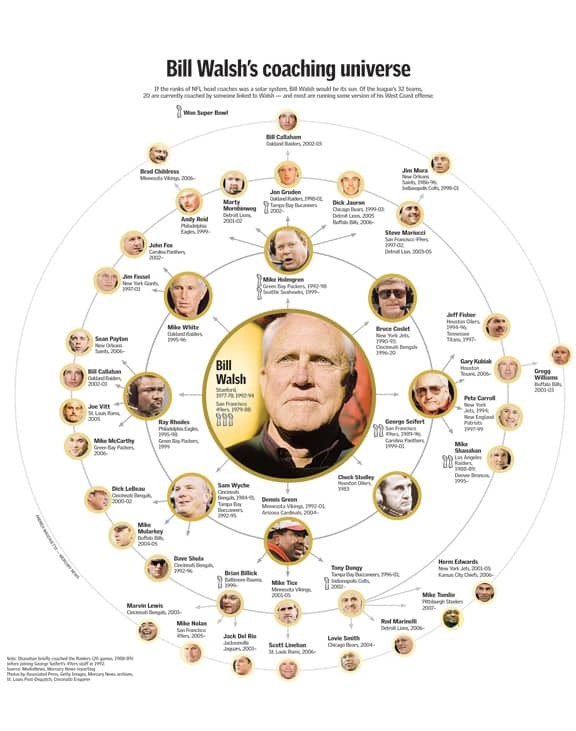 Bill Walsh is one of the greatest coaches in NFL history. When he took over the San Francisco 49ers, they were the worst team in the league with a 2-14 record. Within 2 years, they were the best team in football, winning the Super Bowl, and becoming a dynasty, winning 4 titles over the next 10 years. It’s a simple reminder that the highest level of leadership is making more leaders. Fortunately for us, developing leaders did not stop in the locker room. Walsh’s lessons in leadership have been also captured in the book, “The Score Takes Care of Itself” which is a must read even if you have no interest in football. Reading "The Score Takes Care of Itself" by Bill Walsh on the trip. HT to @jack for the recommendation. Anyone else read it before? Having recently read “The Score Takes Care of Itself” for the second time, I wanted to share some of the best excerpts. The following Bill Walsh quotes are my favorites from the book, which has a lot more depth and ideas well worth learning for any manager or leader. 1) Praise is one of the best tools at a leader’s disposal. Bill Walsh expected his people to strive for perfection in their craft. Whether they were working in the 49ers front office or a receiver running a precise route, Walsh applied his Standard of Performance to everyone’s work. While Walsh spent a lot of time coaching people and setting expectations, he was sure to praise people for good work. He used it as an opportunity to show them an example of what he wanted everyone to strive for, while also helping people feel good about the effort they put in to achieve their great work. Praise was a crucial ingredient to Walsh’s success. Think back to the last time you worked really hard on a project and no one noticed. How did that make you feel? It probably didn’t make you want to do it again. Now compare that to the last time someone did recognize your hard work. I bet you were a lot more motivated to keep up the same effort for them. Make sure you do the same for your people. Have you praised your people lately? Can you afford not to? 2) Preparation and planning for all possible outcomes is critical. When Walsh was an offensive coordinator, he once was playing a road playoff game in front of crazy Oakland Raider fans who were yelling, throwing things, and generally being chaotic around him in the coach’s booth. When his team got the ball with little time left instead of calling the right plays to help them tie the game and force overtime, he froze. His poor play calls cost his team a chance to advance to the AFC Championship game. From that point forward he swore he would always be ready for anything so the chaos of a moment never clouded his judgment. Your best employee walked in and told you they were quitting? You lost your biggest customer to your main competitor? Your product failed in a major way (lost customer records, database failure, product stops working for days)? You suddenly closed a customer 10x bigger than your current largest customer? You had an extra $1 million in your budget? These kinds of questions are regularly asked at some of the best and fastest growing companies in the world. Netflix has developed their own “Chaos Monkey” to randomly take down some of their servers to ensure their engineers build perfect redundancy, so they never have a failure impact customers. Meanwhile, Zenefits literally doubled their sales plan halfway through the year just to see how the thought exercise might push them (and it worked!). Whether it’s a sudden move by a competitor or a rowdy football crowd and the ball on your own 10 yard line, challenging yourself and your team to think through contingencies helps everyone be more flexible and prepared when everything doesn’t go to plan. 3) Leadership is about the example you set and the culture you create. You can’t walk in a room and say, “I am the leader!” and expect people to follow you. That’s more likely to get an eye roll. The way you get others to follow you is demonstrating you deserve to be followed. As head coach of the 49ers, Bill Walsh spent much of his time teaching everyone his standards and using his sharp football mind to make everyone better. Doing so gave him the credibility and respect that allowed his team to buy into his ways, even when everything looked hopeless in his first 2-14 season. Walsh had many moments of doubt in his first two seasons with the team. He really wasn’t sure if it would all work out, especially as they endured an 8 game losing streak at one point. However, after persevering and building a championship roster, Walsh realized all the culture change he brought to a laughingstock organization was the foundation for their later success. During those first two seasons, Walsh not only taught his Standard of Performance, he was getting buy in from players to his methods. Those that didn’t agree were let go, no matter their talent, so that everyone could move together as one. As he put it, “When you know that your peers – others in the organization – demand and expect a lot out of you and you, in turn, out of them, that’s when the sky’s the limit.” And that standard started with the example Walsh set as head coach. As a leader, Walsh recognized he needed to earn the respect of the team. That came by setting a great example, and making sure he had the right people on the team to reach their goals. Initially, a Super Bowl championship may have seemed crazy to aim for, but his commitment to excellence caused others to follow him and eventually aim for and reach that goal. Are you setting the right example for the culture you want your team to have? Do you have the courage to remove those that undermine or oppose your culture so everyone can move in unison? 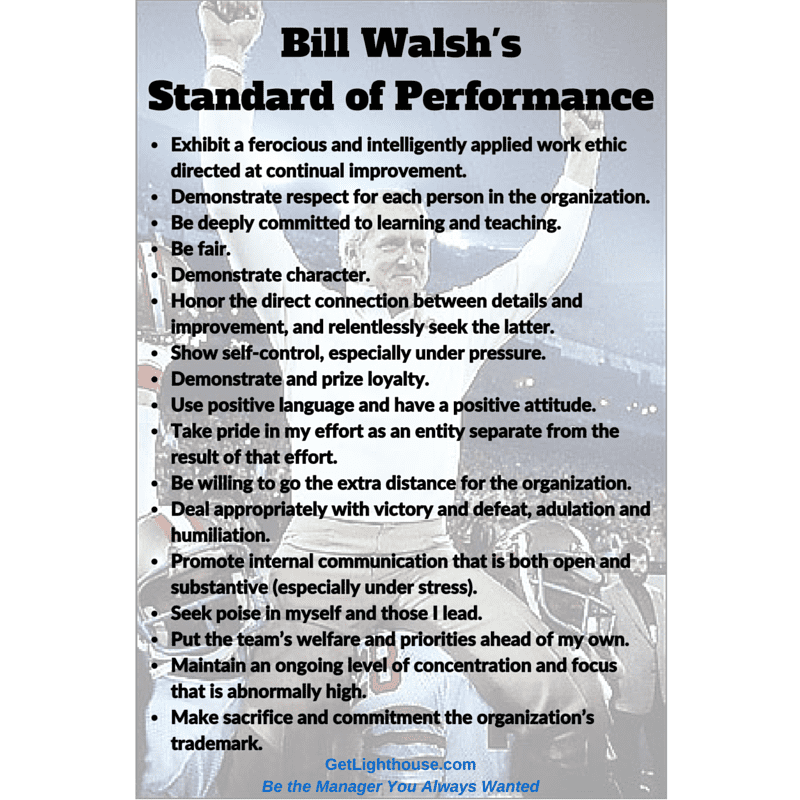 Want to build strong, caring leadership habits Bill Walsh would be proud of? Then sign up for a free trial of Lighthouse, because it will help you with the most important soft skills you need as a manager. 4) Your enthusiasm is contagious and essential to teaching. “Your enthusiasm becomes their enthusiasm; your lukewarm presentation becomes their lukewarm interest in what you’re offering….When the audience is bored, it’s not their fault. Walsh loved teaching people and spent a lot of his time in “The Score Takes Care of Itself” emphasizing how important a skill it is for leaders. Of course, it helped that Walsh loved what he was doing, so he really was passionate about the plays he drew up. He was then putting in the effort to be sure he shared that enthusiasm with the team. Now, instead of Walsh’s exciting play diagramming, imagine someone presenting a boring PowerPoint deck in a monotone voice. 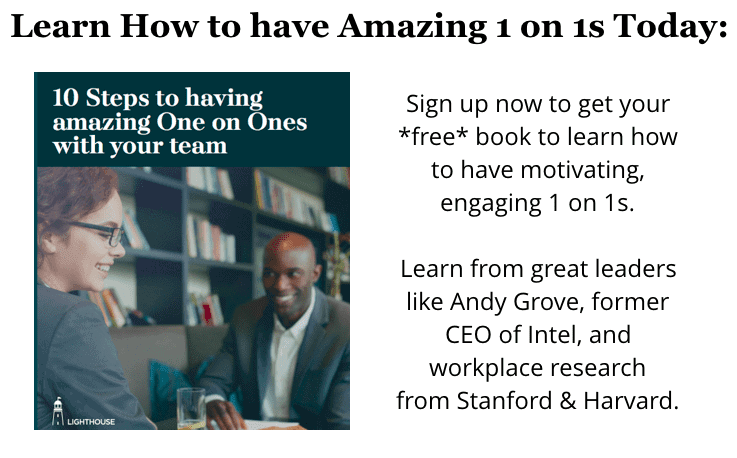 If you can’t get excited about something, how can you expect your people to? Enthusiasm is not just for football. Just because your company doesn’t play in front of 65,000 screaming fans, doesn’t mean you can’t bring some excitement. Tap into what you love about your job and the company you work for. Bringing this enthusiasm to your work is an underrated skill as a leader. And just as Bill Walsh learned of it’s importance as he made the 49ers great, another organization not far from the 49ers headquarters learned the lesson as well. 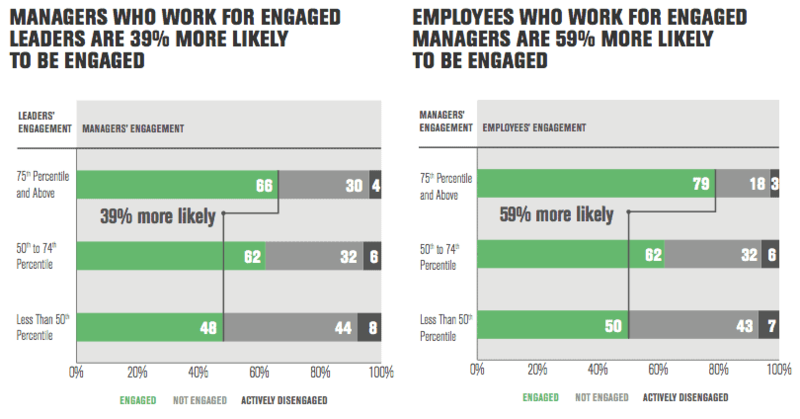 Do you invest time in teaching your people? Are you enthusiastic and passionate when you do? 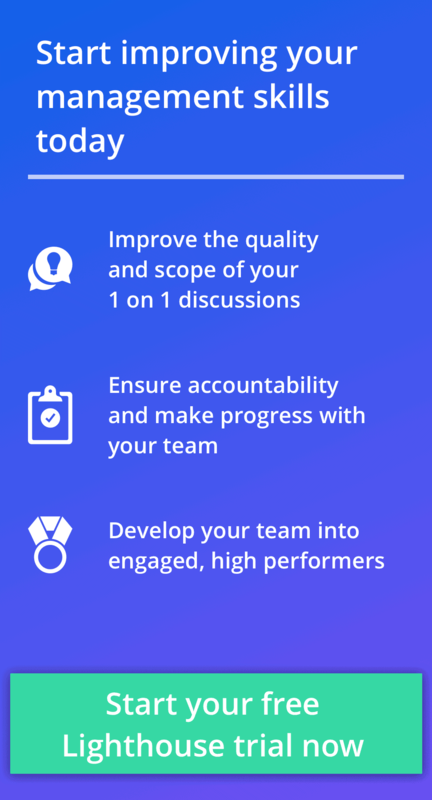 5) Use the four most powerful words in a manager’s arsenal. Joe Montana, arguably the greatest quarterback in NFL history, was not a legend from day 1. In fact, he wasn’t even drafted until the 3rd round and many scouts were down on him. However, Walsh saw something in Montana and made sure “in word and in deed” that Montana knew how much he believed in him. Do you look at your team and only see the skills they have today, or do you consider their potential to do more? There is an incredible opportunity to tap into their deepest motivations if you believe in your team. “I saw how truly caring about someone as a person could unlock an infinite amount of trust and authenticity. It could tear down walls of fear and bridge oceans of uncertainty. Seeing how my manager wanted the best for me was my biggest motivation to exceed his expectations day after day after day. Do you believe in your people and demonstrate it in your words and deeds? These are just a few of the amazing leadership lessons found in “The Score Takes Care of Itself.” If you haven’t read it, I highly encourage you to read it and deeply consider the great lessons that Bill Walsh has shared with us about building world class teams.